NTOYZENI 8 Makroyianni near the Acropolis. Open Thurday through Sunday with four Rembetika singers. ( tel. 9227597, 9219427 ) 2,500 drachs per drink. Matt likes this place. PERIVOLI T' OYRANOU Lisikratous 19, Plaka.Six Rembetika singers, cozy atmosphere.3.000 drachs per drink, 8.000 for full menu.Closed Sunday and Monday. STOA ATHANATON Sofokleos 19. Six Rembetika singers. Food & drinks . Open 3:30 p.m- 7:30 p.m. and at night. Closed Sunday. DIPLOCHORDON 13 Ag. Lavras & Galatsiou Ano Patissia. Two Rembetika singers, one Rembetist violin in musical scheme. 2,000 drachs per drink. Closed Mon. & Tue. tel. 2283867. PONTIKI 9 Eptanisou, Kypseli. New & Old "laika" music. Bottle of whisky 20,000 drachs. Closed Mon. & Tue. ASTROFEGGIA 294 Patission, Agios Loukas. 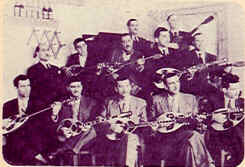 Seven singers, traditional violin. 2.000 drachs per drink, 3.000 for menu. Closed Mon. Tue. wed. Tel. 2010160. MNISIKLEOUS 22 Mnisikleous ,Plaka. Six singers .3,000 a drink . Open Thu. through Sun. (3225558 ). STATHMOS 22 Mavromateon, Pedio tou Areos (Green Park) Four singers. 2,500 a drink. Thu. through Sun. Tel. 8832393 & 8220883. KAVOURAS 64 Themistoklous, Exarchia. Three member laiko and Rembetoko group. 2,000 per drink. Closed Sun. Tel. 3810202. ( fowl,deer, etc ) closed Monday. ( tel.8252767 ). Tue: live flamingo.Wed: live Cuban ,Latin dancing.Lessons every Sun throughThu.early. KSEXASMENO PIGADI ag. Lauras 87, ANO PATISIA. Rock, Latin, Blues, Jazz, Wednesday- Sunday. Entrance with drink 2.000 drs. Friday & Saturday 2.500 drs. ( highly recommended by Michaelis ). TEL:22283063. ROCKLAND 2 Frantzi & Sygrou 55. House band with guest stars every Sat. STAVROS TOU NOTO Frantzy & Tharipou 37, Neo Kosmos. Greek & American rock, changes of bands every day. Mon. through Fri. Panos Katsimichas from the famous Katsimichas brothers sings his top 10 Greek folk rock songs. Panos and I (Dorian) started the band "Agapanthos" which brought us notoriety. Needless to say I highly recommend this club. Entrance with drink, 2.500 drs. Tel. 9226975, 9239031. ALSOS Pedio tou Areos (Green Park) Greek laika and rock alternative. Tel. 8212271.
and bass, Fri. reggae; Sun. live jazz. Tel. 9597995. SIXTIES Posiedonos Ave. 62 , P Faliro. ( by the sea ) . Live sixties band, many alternating guest stars . Perhaps the best sixties music in Greece. ( highly recomended by Dorian and Michaelis ) 3.000 drs. per drink. Closed Sunday & Monday Tel. 9819355, 9812741.
drink. Closed Sun. and Mon. Tel. 7226054. WILD ROSE 10 Panepistimiou, Center of Athens. Pop, sixties, rock party on tuesdays, blue gray decor. Open every day. Tel. 3642160. FOLIE FOLIE 2 Elsin, Ambelokipi. Mon. reggae, Tue.Latin, Wed.Samba, Thu.hip hop, Fri.funk, Sat.mix, Sun. sixties. Open 'till late. (recommended) Tel. 6469852. BE BOP Orminou 4, Hilton Hotel. Live Greek rock, plus jazz, funk, soul. Open all evenings. (recommended by Michaeli) Tel. 7221708. BLUES 20 Panormou, Ambelokipi. Only blues in old neo-classical house. Open all evenings. Not live. Tel. 6433372. KIBUBU 9 Galatsiou, Patissia. The owner is a very good friend of ours. Mexican, Latin decor. Caters to all age groups. No live. 1.500 a drink, indoors and out. (recommended by Dorian and Michaeli) . GRANAZI 20 Lembesi, Makroyianni. Friendly and unpretentious environment. Tel. 9244185. DIAMONDS AND PEARLS 35 Poseidonos, Kalamaki. On the seaside. Striptease. Entrance with drink 5.000 drs. DOLLS 5 Varis Ave., Vari. Entrance with drink 5.000 drs. Tel. 9658698. E......KAI 12 Iosif Ton Ragon, Makroyiani. Tel. 9221742. SIROCCO 255 Sygrou Ave, Nea Smirni. Entrance with drink 3.000 drs. TESSERA 117 Pireus, Gazi. Entrance with drink 3.000 drs. Tel. 9424986. A MILLION DOLLARS 166 3rd September. Entrance with drink 4.000 drs. ATHENS QUEEN'S Glyfada square (seaside) 2.500 drs. per drink. Tel. 8983000. APHRODITE CLUB 177 Sygrou Ave. 3.000 drs. per drink. Tel. 9325534.